The Body Shop, Illamasqua, and Maybelline Blogger Events. Ok Girls, as many of you will be aware over the last 6 weeks or so there has been a few Blogger Events, Namely The Body Shop, then Illamasqua, and finally Maybelline. I decided a while ago that I was going to do this as an "All in One" Blogpost so to speak, and keep the talk about the products we received to a minimum. The reason behind this is purely that I'm 99% sure you will have already read and seen photo's about the products we got a these events, and for me personally after reading the first few blogs I begin to get tired of reading the same thing. Although I do appreciate everyone wants to share their thoughts about the events. Anyway tangent :) I am going to briefly talk about in turn the 3 events and give you my thoughts on the Events themselves. So The body Shop was the first of these events and was based in London. The venue was absolutely fabulous, set in a quirky Bar/Restaurant Sketch. The set up was brilliant and it was superbly organised. Inside Sketch in what I believe was the gallery room was such a lovely set up with colourful balloons and hearts everywhere, white furniture and kitsch cake stands. 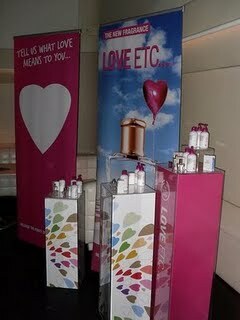 The main focus of the event was the launch of a couple of new products: Love Etc Perfume and the New Pearlescent Cosmetic Line. Initially Chase Aston (a make up artist) gave a make up demo using several of the products from the new make up line on Laura and another model. Following this the group was split into two halves, one who took a trip to a Body Shop Store whilst the other half were given a lesson on Perfumery. Then we swapped and did the opposite. The personal highlight for me was learning about what actually goes into creating a perfume, we learnt about the Base Notes, Heart Notes and top Notes of a perfume, and I found the whole thing fascinating. Love Etc Perfume and Handcream: Lovely Scent, Wish it lasted longer, The Hand Cream: Nothing Special but for a Good Cause and definitely worth a fiver. There were two Events held: One in London, and one in Manchester. I attended the Manchester Event. Ok this was my favourite Event, which you will be surprised to hear as I previously wasnt how shall I say? I wasnt Illamasqua's biggest fan, I thought it was all "hype" and I personally dont own anything from them. I went to the event with an open mind. I wanted to find out more about the values behind the brand and actually get a chance to look and play with the products in an environment away from a make up counter, where to be honest I aways feel slightly pressured to buy something, and 9 times out of 10 I really dont want to hear the Hard Sale from a make up Artist when I say anything I swatch is nice. First off it was so refreshing to have a "Northern" Event. It seems as though some Companies forget there are any major cities outside London lol, and believe me travelling 3 hours to London and back every time there is an event is really rather tiresome. First and Foremost the venue. Oh My God it was absolutely stunning. The event was based at the infamous Ithaca in Manchester. If Illamasqua was a Building, Ithaca would be it. It was all dark and luxurious, with a Black and Silver Decor running throughout. Words can not describe how breathtaking the place was. Just Stunning. When we arrived we were greeted with what can only be described as the most Beautiful - But Lethal cocktails known to man lol. All I know is they contained Vodka and Cranberry Juice of some form.. Whatever else they had in them remains a mystery lol but they did the trick. We then had the chance to play around with several of the products in the Dystopia Range, which to my surprise was no where near as how shall we say "Whacky" as I first thought they would be. It was made up of mainly Deep Greys, Blacks and Silvers with the odd dash of Hot Pink thrown in for good measure. We then watched a short promo video about the collection, and when their was a technical hitch Alex Box stepped in like a pro and talked us through the concepts and inspirations behind the collection. After this came the personal highlight of the event. Sylvia Lancaster, Sophie Lancasters Mother spoke to us about the way in which Sophie was murdered just for looking different. Her strength and courage was just incredible and it moved me to tears, Yes I welled up whilst she gave her speech. She told us all about the S.O.P.H.I.E Charity and encouraged to us to stand up against Hate Crime. It was truly truly inspirational and I count myself as lucky having being given the chance to meet her and listen to her speak. After this we were left to play with products chat, eat the fabulous food served and watch a demonstration carried out by Alex Box on MizzWorthy. Towards the end of the event a few of us got to have a chat with Alex Box, the Make Up Artist behind Illamasqua, she was incredibly interested in finding out more about our thoughts and opinions and wanted to gain an insight into why we "blogged". Upon leaving we were given a goody bag which contained one product (everyone got different products) a contribution towards travel costs, a poster, an Ithaca Card and a S.O.P.H.I.E wristband. I was over the moon with my product as it was the one thing I really wanted to try and knew 100% I would use. I received a pearlescent pink lipgloss called which is just gorgeous! Its in the shade Explode. There was a few hiccups with the Goody Bags but the Illamasqua staff were only too happy to rectify this. So the Maybelline Event only happened a couple of days ago, so there are lots of blogposts flying around about it. Therefore this part will only be brief. I have also done a Youtube video showing and talking about all of the products we received in our Goody Bags and you can find that here. 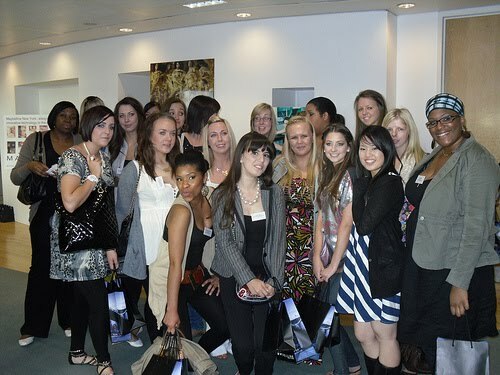 This event was held in London and was organised by the same PR Company who organised The Body Shop Event - Headstream PR. The main person liasing between Bloggers is Natalie Kitcher who deserves a round of applause for organising everyone and making sure everyone has the right information. 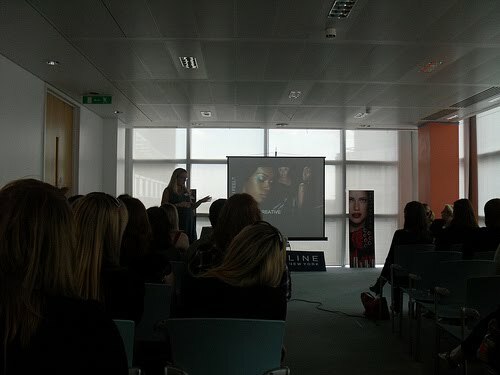 After we'd been fed and watered we listened to a brief presentation and found out about the Brands core values and learnt a little bit about their new products - The pulse Perfection Mascara and Colour Sensation Lipsticks. After this we were given our goody bags and left to visit the "stalls" to try out different products. I thought that the Foundation Stall was fantastic as it allowed us to pick the right shade and formulation that suited us. Therefore we actually received foundations that we could use and were the right shade. Another fantastic event, superbly organised, although I felt again there were just far too many people, At times it was so cramped you couldn't physically move! This was the only thing I could fault with this event and in all fairness I'm not really sure this problem can be eradicated. So there you have it!! I feel incredibly lucky to have been invited to these events and had lots of opportunities to meet up with some fantastic girls. Gemma! Haha. The Illamasqua event looked brilliant. Anywhere that provides cocktails is a winner for me! Looks like you had a great time at the events! You have written it up really well!! I really wanted to talk to you at Maybelline but because I had to leave early to get to the theatre I didn't have much of a chance!